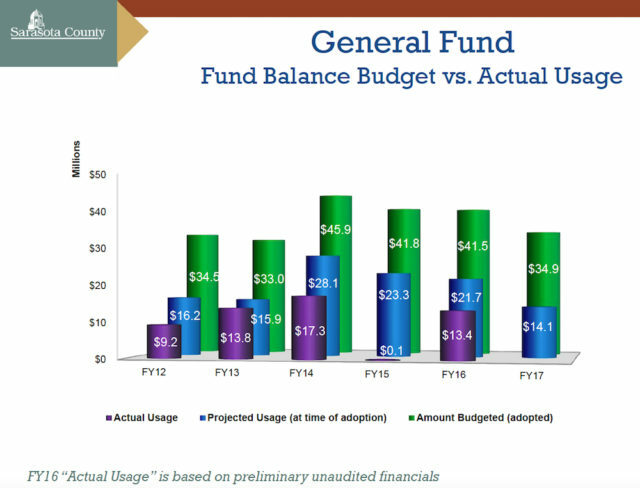 The latest projections show that Sarasota County’s General Fund revenues will not exceed expenditures until the 2027 fiscal year, Deputy County Administrator and Chief Financial Management Officer Steve Botelho told the county commissioners during their Feb. 17 workshop. The good news, though, is that if property values continue to climb — as the state has projected — and staff keeps expenditures from rising higher than 3.6% a year, the board should not be looking at a General Fund deficit until the 2019 fiscal year, and the projected amount is $3,542,392. The previous run of the budget model — in September 2016 — showed the 2019 fiscal year deficit would be $5,604,659, Botelho noted. As County Administrator Tom Harmer explained, any amount between $3 million and $5 million “is especially manageable,” through careful planning with expenditures and searches for revenue sources to fill the gap. The software model county financial staff has utilized for the past several years assumes a 3% growth rate in most major revenues, Botelho added. 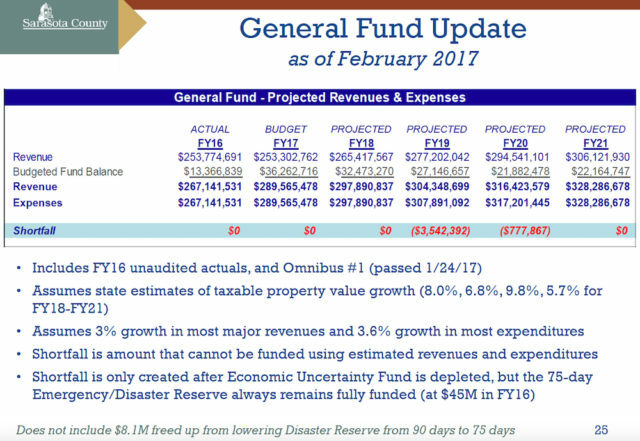 The projection for the 2018 fiscal year calls for use of $32,473,270 from the county’s economic stabilization reserve fund to balance the budget, Botelho’s chart showed. However, the final budget figures for the past several years illustrated the fact that the county has used considerably less money from that economic stabilization reserve than staff had anticipated. From the 2012 fiscal year through the 2015 fiscal year, the money projected to be needed from that “rainy day” reserve ranged from a low of $33 million in FY13 to a high of $45.9 million in FY14, as the county dealt with a loss of 38% of its overall property value as a result of the Great Recession, another chart showed. However, the largest amount the budget actually used in those four fiscal years was $17.3 million, according to the chart; the least was $100,000, in FY15. Botelho explained that staff will not have the final audited figures for the 2016 fiscal year until December or January 2018. It is commonplace for local governments to use reserves to balance their budgets, Harmer noted. In the 2014 fiscal year, Harmer added, staff was projecting a budget deficit of $25 million for FY16; but, staff has worked to keep pushing any potential gap into future fiscal years. Commissioner Alan Maio added that staff has found “additional funds and efficiencies” to make that possible. The most recent state projections for adjustments in property values — released in December 2016 — predicted an increase of 8% for FY18, 6.8% for FY19, 9.8% for FY20 and 5.7% for FY21, according to a chart Botelho showed the board. Only one of those had changed since the previous figures were released in August 2016, he noted: The FY20 number in August was 9% at that time. The adjustment relates to the expiration of a non-homestead exemption cap on home values, the chart explained; proposed legislation would extend that cap. 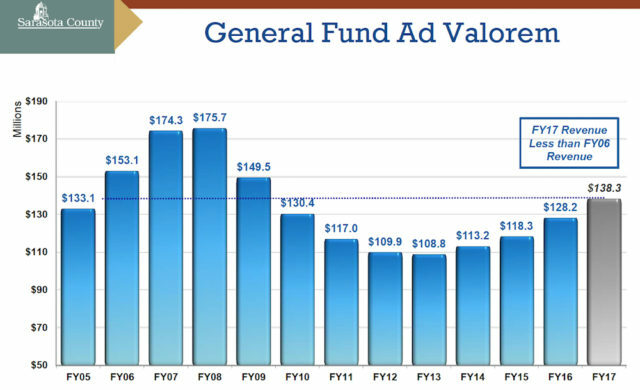 The biggest source of revenue for the General Fund is ad valorem tax revenue, Botelho told the board. For this fiscal year, $138,297,666 in property tax payments make up 48% of the total. The smallest source of money for the General Fund is interest. This fiscal year, the $1.2 million budgeted from that source represents 0.4% of the General Fund, a chart showed. In response to a question from Chair Paul Caragiulo, Botehlo said that all the other sources of revenue for the General Fund have been trending upward at a rate of 2% to 5% over the past few years, with the exception of the communications services tax. During the discussion, Botelho also pointed out that the budget projections do not include the county’s reserves. Overall, Harmer said, the county has about $150 million in various reserve funds. Maio also pointed to what the board jokingly has referred to as “the Barbetta Fund,” more than $8 million that resulted from a change in board policy regarding how much money should be set aside in a reserve for use in maintaining operations in the event of a catastrophe. The Sarasota County policy used to be 90 days. Barbetta sought the change to 75 days in 2013 to free up money that he felt could be used for capital projects to boost the county’s economy. Yet, the board never has voted to spend that money. Last year, then-Commissioner Christine Robinson pointed out during a budget workshop that the board had agreed to keep the funds set aside in the event they were necessary to fill a gap between revenues and expenses for the World Rowing Championships this fall. If none of the money was needed for that purpose, commissioners suggested it might be used for initiatives — such as a shelter — for the homeless. Harmer noted that on Feb. 17 that “the best practices” call for a 60-day reserve. He added that the Sarasota County Commission has been more conservative in maintaining the 75-day reserve, which holds about $45 million. Botelho recommended on Feb. 17 that the board continue to refrain from using the $8.1 million in planning for the 2018 fiscal year. He indicated that was based on a preview of coming fiscal year budgets the Sarasota County Clerk of Court and County Comptroller’s Office had run, as required periodically by Statement No. 54 of the Governmental Accounting Standards Board (GASB). Based on the Clerk’s Office analysis — which assumed the county would spend all its fund balance in the current fiscal year and that it would use the $8.1 million and its 75-day reserve — the county would see a shortfall of $5,566,796 in the 2018 fiscal year, Botelho pointed out. 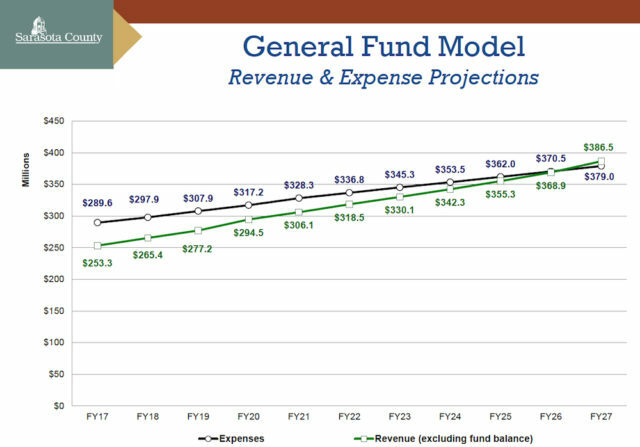 Referring to the ad valorem tax revenue, Botelho provided the board a chart showing that the projected figure for this fiscal year — $138.3 million — is still below the amount the county brought in for the 2006 fiscal year: $153.1 million. As for the millage rate: Commissioner Charles Hines pointed out that it remains the second lowest in the state for this fiscal year. 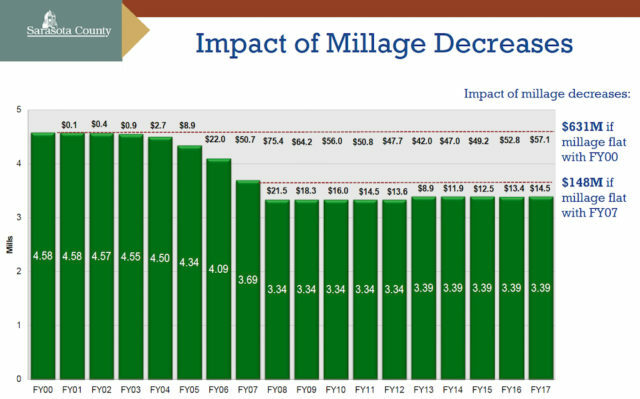 If the board had kept the millage rate at 3.69 mills — the level in the 2007 fiscal year — the county would have received about $148 million more in ad valorem tax revenue through this fiscal year, as illustrated in a graphic Botelho had included in the board’s agenda material. Because of the recession, commissioners chose to lower the rate to 3.34 mills in the 2008 fiscal year, Botelho noted. The total rate climbed to 3.39 mills in FY13 because of the need to raise the Mosquito Control District millage rate.